Nov-Eight™ 8 plait rope combines the strength and tenacity of a durable single braid Nylon Rope with a firm square braid that feeds well in modern anchor windlasses. Easy to handle, Nov-Eight stows in anchor lockers using a fraction of the space of equivalent size and length 3 strand ropes. Nov-Eight resists twisting and hockling making anchor deployment and retrieval easy and stress free. 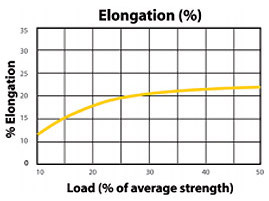 Nov-Eight is ideal for use in marine applications that demand a high level of elasticity built into the rope to absorb shock loads. Built from high tenacity Nylon 6.6 yarns, Nov-Eight grabs in the jaws of popular marine windlasses and can be spliced directly to chain to create a strong and durable anchor rode that lasts for many seasons. Nov-Eight is initially soft to the touch but is designed to be firm to use after wetted and dried on its initial use.